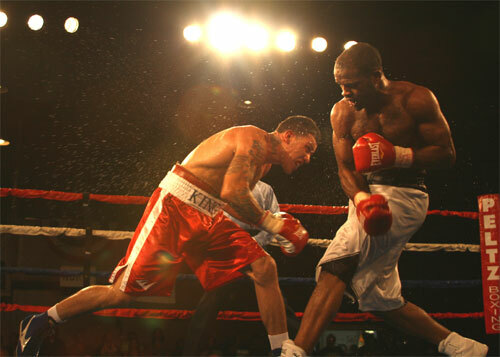 Derek "Pooh" Ennis retained his USBA junior middleweight championship with a rousing 12-round majority decision over "King" Gabriel Rosado Friday night before a frenzied crowd at the South Philly Arena. It was a fight that brought to mind the great old days of Philadelphia boxing when the city's best boxers fought each other simply to prove that they were the best. The dramatic contest had the crowded arena on its feet throughout the bout, alternately cheering for each man. 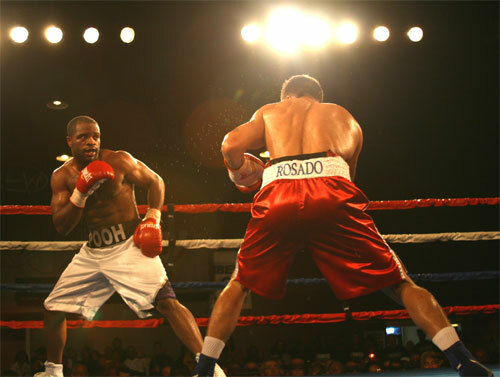 In the end, it was Ennis, 29, who came away with the victory over the 24 year old Rosado. Both fighters gave excellent performances and produced a battle so beautiful and entertaining that it had the old timers wondering if perhaps they do make them like they used to. The bout lived up to every expectation that had been set prior to fight night, and truly seemed to put to rest questions of whether two Philadelphians should be matched together. For it is clear that if such brilliant battles can be made simply by unleashing local fighters upon each other, the sport could enjoy a boom of popularity that has not been seen in quite sometime. Along those lines, it is too bad that more people didn't witness the event. But for the 1,132 lucky spectators who did, it was a night and a fight they will surely remember. What happened in the ring was clear. Two talented fighters with much on the line clashed for twelve rounds, giving all they had. The fight played out in three Acts - just like most of the great ones do. 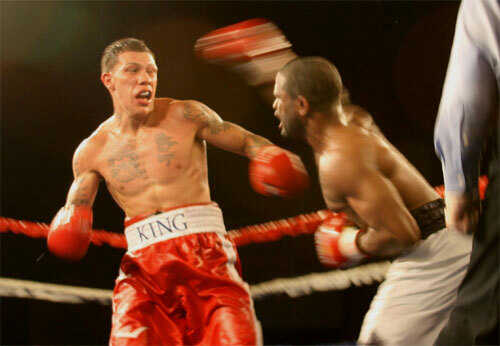 Rosado started fast and displayed his strength, punching power and assertiveness in the opening three rounds. In this opening Act, Rosado pressured the champion and used an ambitious work rate to back him up and make him defensive-minded. When Rosado moved forward and stayed busy, the smaller Ennis had no choice but to cover up and survive. It was during this nine-minute period that it appeared the challenger would be just to big and strong not to bring home the win. However in round four, Ennis shifted the tempo and began to box his way into the fight. Carefully selecting his punches, the champ began to penetrate Rosado's defense. It served as a glimmer of hope for Ennis and his cheering section. Gaby rebounded the fifth, but a sharp right by Ennis found its mark near the end of the round, and perhaps ushered in the start of the second Act. Beginning in round six, the pace and action of the fight changed. Instead of pressing forward as he had done through most of the prior sessions, Rosado down-shifted to a counter-punching style that allowed Ennis to re-enter the fight. As Gaby waited, Pooh began using his fast and accurate punches to chip away at the points deficit that he found himself saddled with like a large credit card bill at the end of a spending spree. Ennis stayed focused and fought smartly. He slowly and surely closed the points gap with beautifully placed jabs and combinations that kick-started a major change in the fight's momentum. Ennis mixed in enough power shots to make Rosado hesitant about charging in. It was in these middle rounds that Ennis seized control of the fight. Rosado was still there and the fight remained competitive in every round, but with him still waiting and counter-punching, he was no longer winning the exchanges. Rosado backed up when he should have been moving forward and he was waiting when he should have been punching. Perhaps fatigue was playing a role; or maybe it was the dread and uncertainty that a fighter must feel in his first 12-rounder. Whatever the case, things had changed, and Ennis swept rounds six through ten. It was during this second Act when the crowd became a factor. As the fight settled into a brisk boxing match, Rosado's fans tried to encourage him to return to gladiator mode. "Gaby, Gaby, Gaby," they chanted. Their voices filled the arena and boosted the already high energy level of the place. Not to be undone, Ennis' fans answered with their own chants of "Pooh, Pooh, Pooh." Back and forth the cheering went, and each time it did, the fighters responded. For Ennis and Rosado, the chants were like swigs of Red Bull energy drink. Every time they heard their name, the two warriors stepped on the gas. Perhaps in this era of video games and interactive entertainment, the crowd forgot itself and believed they were in control of the action. Their chants were like a spastic thumb on a video game controller, clicking away with a frenzy. As crazy as it seemed, their work was paying off. The involvement of the crowd created an atmosphere that elevated this already memorable fight to a whole new level. With the rounds Ennis banked during his run in the middle of the fight, the overall score felt deadlocked after the tenth. But Ennis had been rolling so long, he clearly had the momentum and it appeared he would just cruise to the final bell. Knowing that the fight was extremely close and that he needed to turn the fight around, Rosado stormed out for round eleven with one thing on his mind - a knockout. Suddenly he was back. Moving forward, throwing punches and making headway. Rosado pressed Ennis around the ring. Midway through, he landed a hard body shot that froze the champion in his tracks. Rosado followed up with a combination of hard punches that hurt Ennis. The crowd went wild. Rosado swung for the fences, but Ennis showed just how tough and determined he was. He fought back, but Rosado was in charge again. The final round started where the eleventh had left off. Rosado threw himself into the battle looking for the knockout. The excitement hit a fever pitch as both fighters laid everything on the line. They were tired and slightly battered - both showing marks around the eyes - but they capped their already glorious fight with a three minute all-out war. In the final minute of the fight, Ennis blasted Rosado to the body and followed with a right to the chin that wobbled the challenger. As Rosado's legs quivered, he stumbled across the ring, but managed to stay on his feet. His back hit the ropes and it must have felt like heaven. He collected himself for a second and then ran right back into the fray. Both fighters spent the last bit of energy they had in those waning seconds, trying to seal their effort and secure the fight. The bell final sounded, but you got the impression that the fighters wanted to go on. The crowd sure wanted them to. But as all good things do, this memorable throwback fight came to an end. While we waited for the official scores to be read, there was a strong feeling that Ennis had won - with his impressive run in the middle rounds and 12th round capper - but everyone knew the fight was close. Judge George Hill scored the fight a draw at 114-114, and suddenly it was feeling really close! However the remaining two judges overruled Hill's even slate with scores of 116-112 (Pierre Benoist) and 117-111 (Joe Pasquale) both for Ennis. My score originally read 116-112. However, while writing this report, I discovered an error on my card that brought my tally down to 115-113 for Ennis (or 7 rounds to 5). 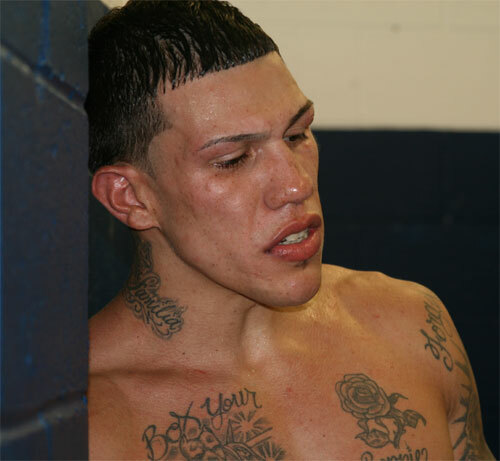 After the bout in his dressing room, Rosado was at a loss with his loss. "I thought I did enough to win it," he said. "What do I do from here? I don't have that feeling that it's over, but five losses? I need a better (career) plan." As Rosado pondered his future, the Ennis camp entered the dressing room. The fighters and both teams showed a healthy respect and friendship, even after such a rousing fight. "Great fight. Great fight. 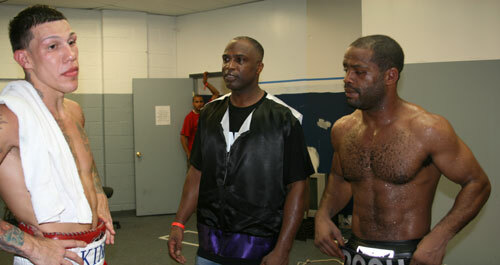 Great fight," Bozy Ennis, trainer and father of Pooh, said backstage. Gaby's a warrior. Gaby's my man. I didn't want it like this. I wanted us to get to the top and Gaby to get to the top too. Then we could fight and all make a lot of money." Pooh cut in. "It's like I said, it's like a basketball game. We just did our thing. It's not personal. Now I need your help. And I can help you. We can work together." His father agreed, "You come to the gym anytime." You know you're my man," Bozy said to Rosado. The code of sparring between fighters is a pretty sacred thing. It's all about trust these days. Today there is always a lot of talk of spying and other competitive posturing between fighters - even when it comes to training. So an open invitation is definitely an olive branch. 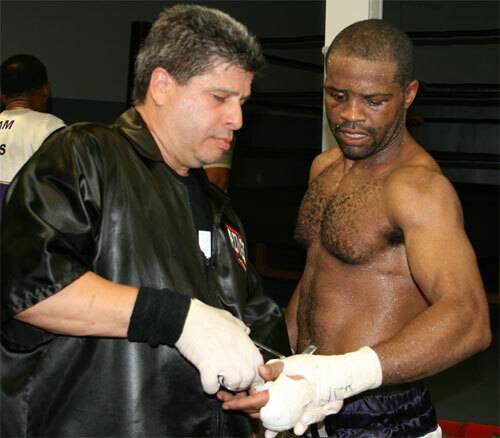 When he saw how disappointed Rosado was, Ennis consoled him. "Man, you still young though, dog! I'm 29. If I lost this fight, I'd be finished," Ennis chuckled. "You'll be back." The win for Ennis brought his record to 22-2-1 (13 KO). With it he keeps his USBA strap securely around his waist and figures to upgrade his IBF world ranking to a spot somewhere near the middle of the Top 10. But on this night, when Ennis came to fight in the best condition of his career, he also proved his worth as a Philly fighter. Over the past year, Ennis has swapped that string of easy opponents he faced early on with some very serious competition like Eromosele Albert, Jose Gonzalez and Gabriel Rosado. He proved that he can look good against the best of his league, and now looks to prove himself at the next level too. At 29, he won the most important and most satisfying victory of his career. Rosado slipped to 14-5 (8 KO) and continues on his slow road to the elite level. He and trainer Billy Briscoe have taken their lumps before only to progress in the wake of defeat. Rosado has faced very stiff competition in his young career and is still improving and learning on the job. Although this was his fifth loss, it was a fine performance that suggested he can find success in boxing. He's a gutsy fighter that will continue to rise in the ranks if he can consistently play to his strengths. This was an excellent opportunity for career advancement that slipped through his fingers, but only slightly. 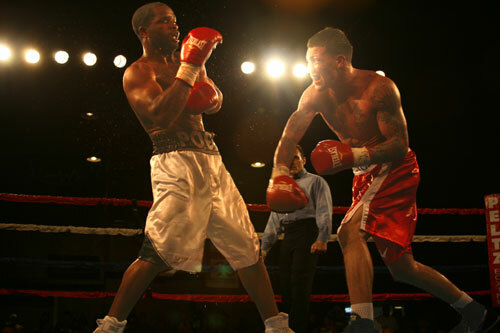 Rosado will be back and will continue to thrill crowds. In addition to the reputation of each boxer, the other big winner on this night was the assembly of boxing fans that came out and experienced the fight in the flesh. If there were any casual fans of the sport in the crowd, it is a sure bet that the fight has turned them into addicts craving the next Philly brawl. Unfortunately fights like these only come along every so often these days. But if we learned anything this time out it's that there is no crime in matching two local boxers against each other. Quite the opposite. If the match is right, and the stakes are right, and the crowd is right, we can return to the days when boxing in Philadelphia was really a thing of beauty and not just a ghost of better days. Ennis and Rosado showed us how it can be done. Now we have to wait and see if the fight was the start of a new trend or just a splendid reminder of what Philly Boxing History is all about.